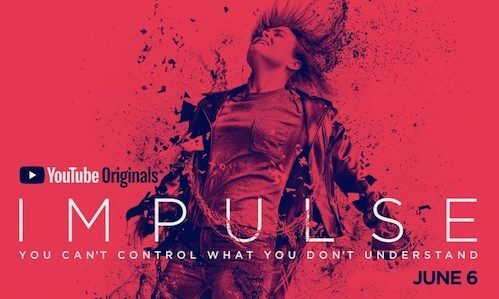 YOUTUBE ORIGINALS “ORIGIN” and “IMPULSE” with Paul W.S. Anderson are bound for SDCC! ORIGIN, a new YouTube Original series from director Paul W.S. Anderson and the producers of The Crown and Outlander, stars Tom Felton [Harry Potter film franchise, Rise of the Planet of the Apes] and Natalia Tena [Harry Potter film franchise, Game of Thrones]. The 10-episode series follows a group of outsiders who find themselves abandoned on a ship bound for a distant land. Now they must work together for survival, but quickly realize that one of them is far from who they claim to be. IMPULSE, which released on June 6, 2018 to critical acclaim [currently 100% on Rotten Tomatoes], is from director/executive producer Doug Liman and follows a rebellious 16-year-old girl, Henrietta (aka “Henry”) [played by Maddie Hasson] as she grapples with her newfound ability to teleport while her world spirals out of control, while her sister Jenna [played by Sarah Desjardins], grapples with issues of her own. DESCRIPTION: From the producers of The Crown and Strike Back comes the riveting new sci-fi thriller series ORIGIN. Watch never-before-scene footage and join stars Tom Felton (Harry Potter Series), Natalia Tena (Game of Thrones), Nora Arnezeder (Mozart in the Jungle) and newcomer Sen Mitsuji along with writer/creator/executive producer Mika Watkins and director Paul W.S. Anderson (Resident Evil). DESCRIPTION: You can’t control what you don’t understand. Get an inside look at the critically-acclaimed YouTube Original series IMPULSE. Watch scenes from the series with executive producers Doug Liman (The Bourne Identity, Edge of Tomorrow), Gene Klein & David Bartis (Suits), along with showrunner Lauren LeFranc (Agents of S.H.I.E.L.D.) and star Maddie Hasson and Sarah Desjardins as they explore the mysterious town of Reston, New York where 16-year-old Henrietta “Henry” Coles is an outsider. Everything changes for her when a traumatic encounter triggers an extraordinary ability to teleport – unleashing a new power she cannot control. PREVIOUS POST Previous post: CBS Studios: Charmed, Star Trek Discovery, Magnum PI, Twilight Zone Make a SDCC Impression! NEXT POST Next post: What’s Going ON at Hordak’s Pop-up Lair? Prince Adam Exclusive Figure SDCC 2018!